The Trails at Windermere utilizes a Solar Aquatics System (SAS) to treat effluent to advanced secondary and tertiary standards through a series of aerated translucent tanks that host plant communities and aerobic microorganisms. SAS duplicates and optimizes the natural water purification processes of freshwater wetlands. 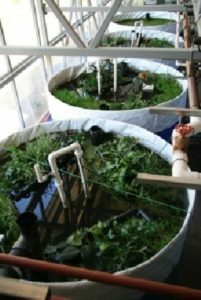 Wastewater is circulated inside a greenhouse through a series of clear tanks, each with its own aquatic ecosystem, and marshes. In this treatment process, sunlight, oxygen, bacteria, algae, plants, snails and fish work together to purify the water. Unlike mechanical treatment processes, these systems are complex, dynamic, self-organizing, and resilient, so they can adapt to changing effluent quality better than mechanical/chemical systems. Our solar aquatic facility treats waste in a way that is in keeping with the high value our community places on ecological integrity.